Doug: Last Wednesday Karen kicked off our now-ongoing retrospective on Saturday morning cartoons with a nice discussion of the Banana Splits. 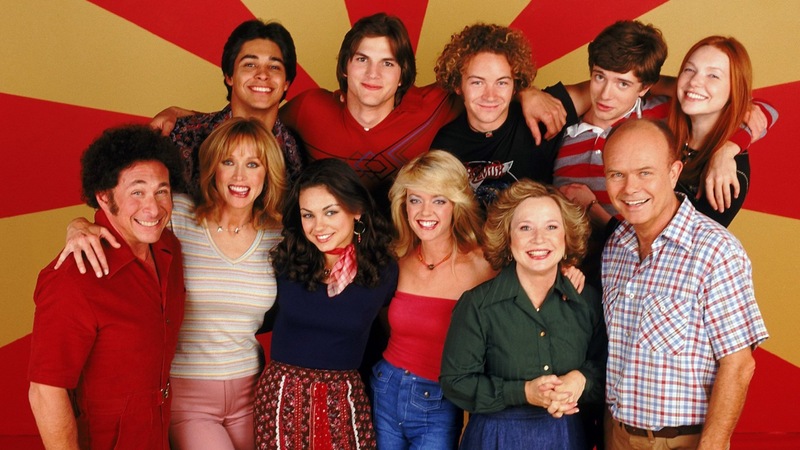 Like many of you, I came to that show in syndication, vividly remembering it on weekday afternoons. I didn't make any comments at the time, but I'll belatedly toss out a big "thanks!" to those of you who jogged this old guy's memory with such things as the Adventures of Huckleberry Finn. I had completely forgotten about that! Doug: Which brings us to today. A few weeks ago when Karen and I were discussing this "series", some of the shows that came to my mind were cartoon versions of the Osmond Brothers and the Jackson 5. Does anyone remember those? I don't recall a lot of details -- like many of you, I do have recollections mainly of waiting for the songs. I've included some clips below, so you can see the quality of the animation. As these were undoubtedly snatched straight from the TV, the quality is sketchy. But you'll get the idea if you've never seen this before. And, let's not limit ourselves to just these two shows. If you know of other musical acts that were "cartoon-ized", then by all means toss 'em out for all of us to discourse on (Beatles, anyone?)! Doug: I mentioned to you quite a while ago that I bought a copy of the DC Comics Library edition of Superman: Kryptonite Nevermore. I got a sweet deal on Amazon from a book dealer in Arizona (took it right out from under Karen's nose, did I). How's a used-like-new copy for $5.50 sound? Yep, MSRP was $40 on that bad boy. I was a happy fella when the package arrived back around my birthday in June. 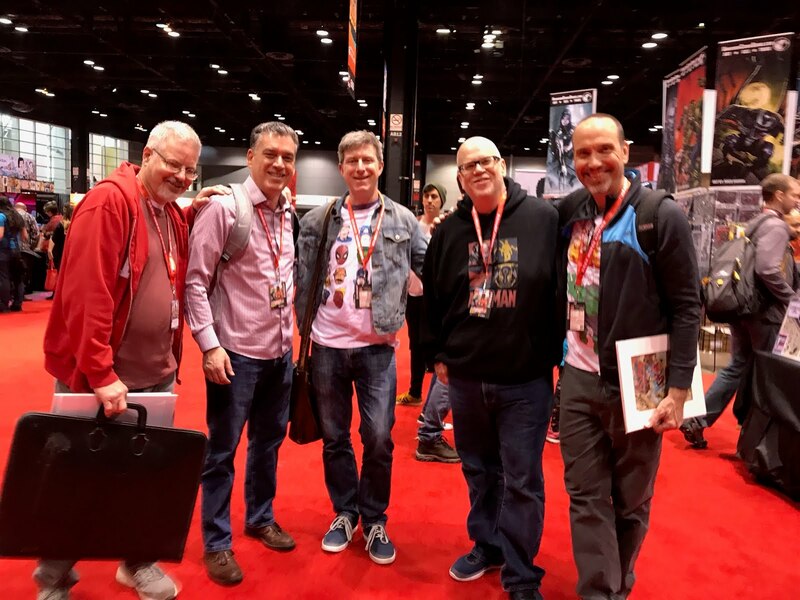 We've been saying for years that we have to get more DC on the blog, and we especially need to get some Superman reviews posted. Since I don't have very many stories featuring the Man of Steel, this book seemed to fit several bills. I'll be picking through these stories off and on in the months to come; we'll enjoy the ride together! Doug: You know, we joke now (scoff, sometimes) at DC's seemingly-constant rebooting of their heroes, titles, and indeed universes. 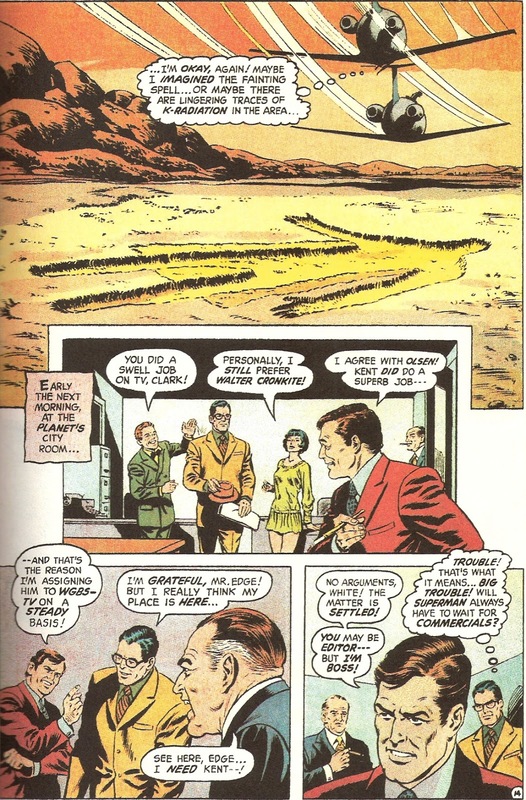 But even back in the late Silver Age and early Bronze Age, the Distinguished Competition was doing some heavy market strategizing with revamps to Batman ("new look" in 1964, O'Neil/Adams "Dark Knight" in 1970), Green Lantern (O'Neil/Adams in 1970), and Wonder Woman (Diana Prince arc, 1968). It only seems fitting that the company's flagship character would also get a makeover, and that came in today's reviewed issue. Julius Schwartz had taken over the Superman titles from longtime editor Mort Weisinger; things were going to change. 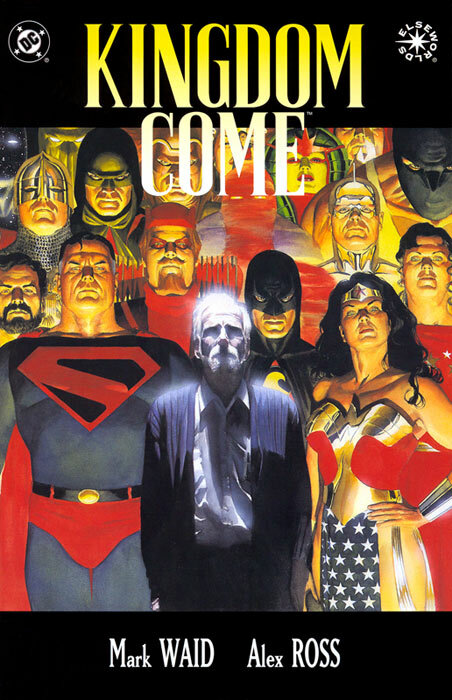 Gone would be the Superman robots, the bazillion survivors of Krypton, and the Super-Pets. Oh, and one more thing -- Kryptonite. Yep, this was billed on the splash page as "a return to greatness", and the iconic Neal Adams cover even sported a big fat 1 on it. This wouldn't be yer daddy's Man of Steel, junior! Doug: We begin in a "proving ground" somewhere in the American desert. Superman's come to monitor an experiment whereby a Professor Bolden hopes to create a reaction that would provide cheap energy from green Kryptonite. Superman, always prepared for the worst, had crafted a giant leaden dome-like shield should the experiment somehow go awry. Well -- you guessed it: AWRY City, baby! There's an explosion, and as Superman rushes in with the shield the whole lab blows, bathing Supes in a green glow. Gonna be a goner, is he -- has to be! You'd be wrong. 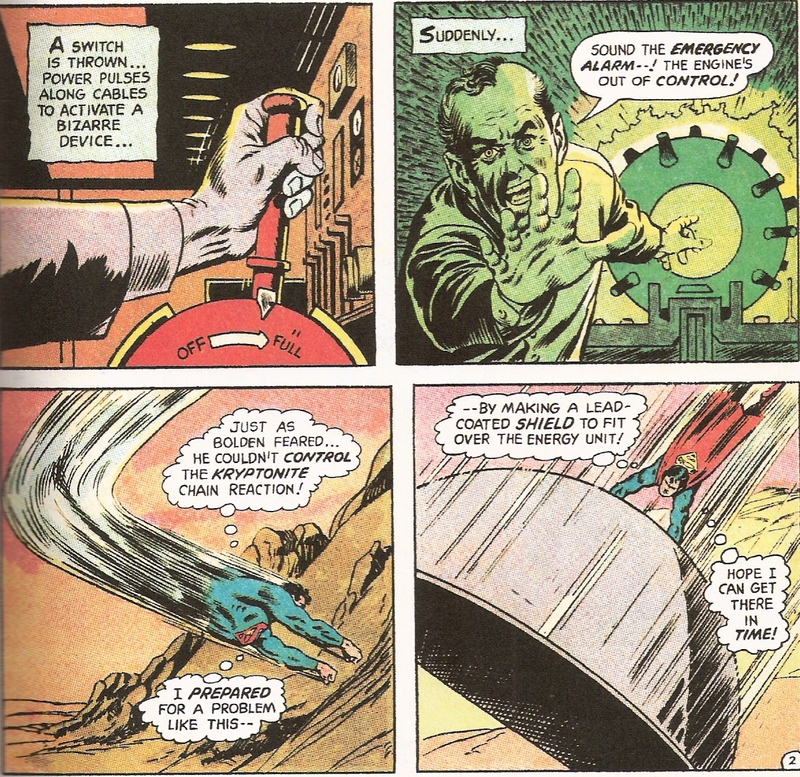 Superman is knocked unconscious, and tense minutes later he comes to with the Professor and other scientists present. They notice that a small sample of Kryptonite that had been in the lab has been transmuted to harmless iron. Soon, another lab rat runs up with some green K that had been stored at some distance; it, too, has been changed to iron! Superman flies off to investigate to see if indeed all the world's green Kryptonite has been rendered harmless. Doug: We cut to the Daily Planet, where the usual cast of reporters and cub reporters is assembled. The Planet has just published a "stop the presses!" edition proclaiming the end of green K, and the no-doubt invulnerability of Superman. 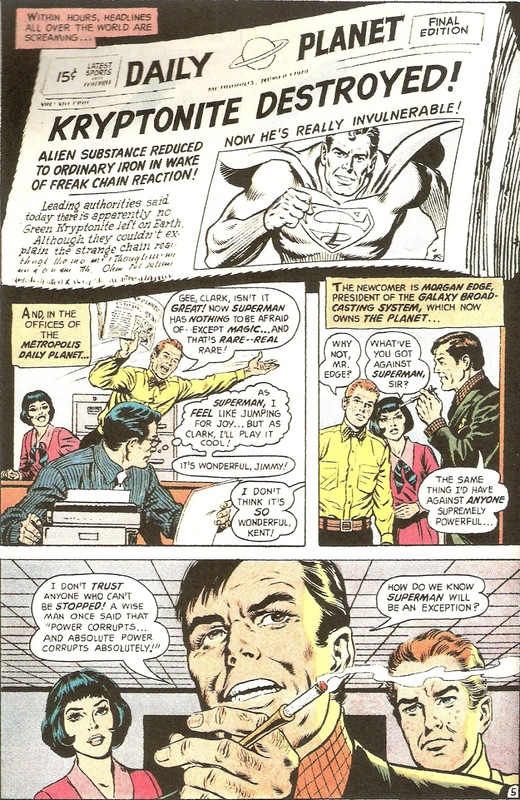 Clark Kent, amazingly -- must have been a quick trip around the world to scope out that green K cache -- is at his desk and decides to mute his enthusiasm somewhat as Jimmy Olsen rushes through the office blaring the good news. However, in walks Morgan Edge, now owner of the Planet. He's not a happy guy, you see -- any fella whose invulnerable simply cannot be trusted. Then Edge brings us to the next big change in the life of Clark Kent/Superman -- he assigns Kent to take a television camera and cover the launch of the new mail-rocket. Kent protests, saying he's a newspaper man; Edge reminds him that he's an employee and is now working for WGBS-Television. This scene evoked memories of several weeks ago, when the Chicago Sun-Times laid off their entire photography staff of 38, choosing instead to send their reporters out with a digital camera. Denny O'Neil was somewhat prophetic when writing this scene! Doug: Kent does indeed cover the launch, which is apparently within driving distance of Metropolis. I'm thinking if Metropolis is some sort of stand-in for New York City, this is pretty implausible. Hmmm... was this still writing intended for 10-year old boys? Anyway, Clark uses his X-ray vision while on the air live (so that wouldn't erase the tape in the video camera?) and spies a "suspicious-looking" chap with a walkie-talkie. Sending his report to a station break, Clark whips through a change into his fighting togs. 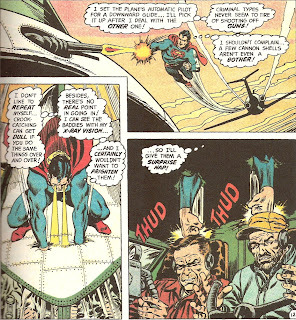 I'd forgotten one of the sillier aspects of the Clark Kent/Superman backstory -- when doing the quick change, Clark obviously couldn't leave his clothes laying around in a phone booth or some other public locale, so he instead stuffed them into a pocket in his cape! Funny how we never saw that bulk -- I mean, the guy just took off a suit -- and his shoes! Glory be.... Ah, I'm trying to be positive here. 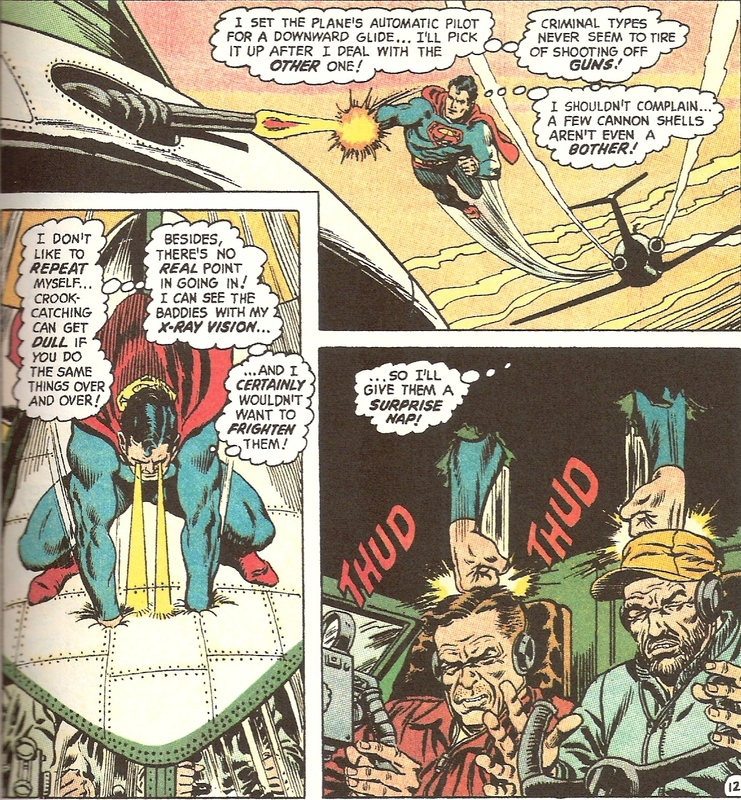 Superman accosts the creep, who boldly admits that he and his cronies are going to heist the rocket and sell it for money to some foreign power. And just to show that they've covered their bases, this guy busts out a piece of green Kryptonite from his satchel! What, could you just buy this stuff at Wal-Mart?? 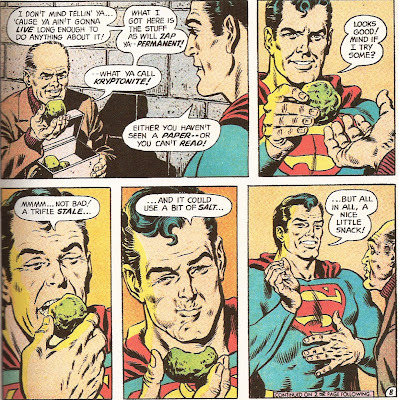 Of course, it's gone powerless, and to prove it, Superman snatches it from his adversary and... eats it! This triptych of panels has been reprinted before. 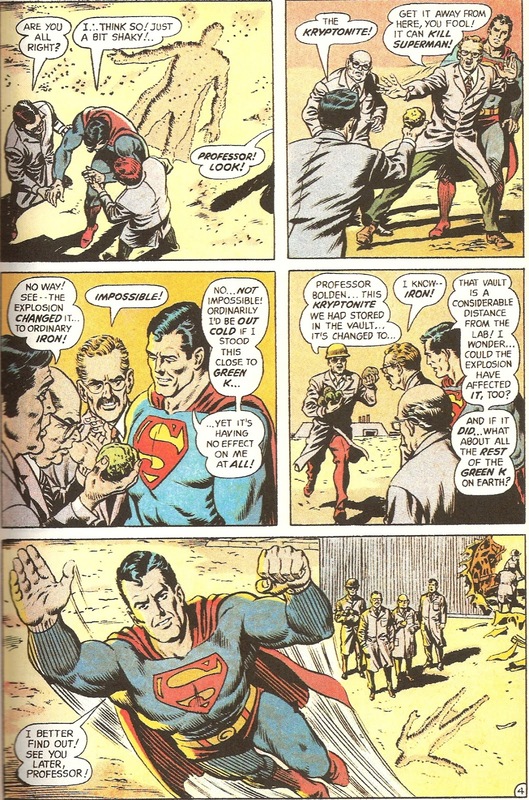 I think in the first two Curt Swan shows one of his strengths, and that is facial expression; however, in the third I'd argue that Superman doesn't even look like the same guy! 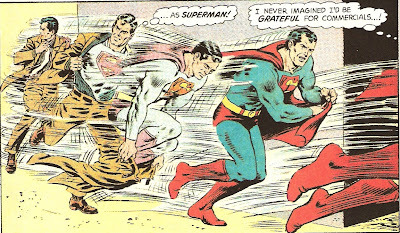 Weird... Superman then thumps the crook on the chin, and hightails it back to his spot on camera as Clark Kent. Doug: As Superman flies over the site of the earlier accident, he's suddenly overcome by a feeling of weakness. He thinks that his strength is waning, and that it's worse than the feeling induced by prolonged exposure to Kryptonite. But as he passes that area, he's suddenly revitalized. Back at the Daily Planet, Clark returns (still wearing the tan suit) to a sea of compliments from Jimmy, Lois (sort of), and Morgan Edge. One guy isn't too happy about Kent's report, and that's Planet editor Perry White. White protests that he needs Kent on the paper; Edge reminds Perry White who is boss now. And on the side, Clark Kent wonders how in the world he'll be able to switch to Superman while waiting for the next commercial break. Doug: There's an epilogue to the story. 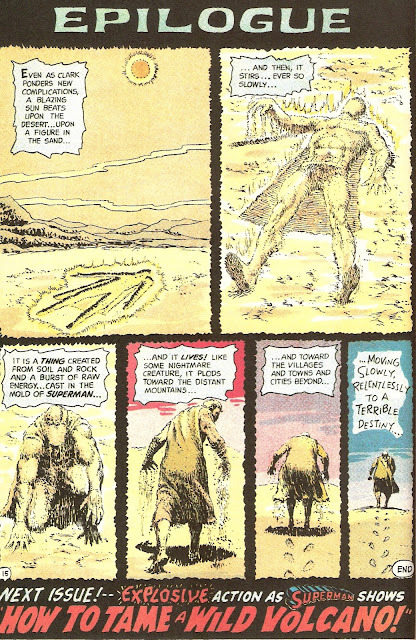 Back in the desert, the impression that Superman's body had made in the sand after the explosion suddenly comes to life. It rises as a filled-out figure, and then begins to shuffle off toward the mountains -- heading east! Doug: As I've clearly stated, this story has some holes in it. If you've followed the Bronze Age Babies through the years, you've probably gotten the vibe that I'm not generally gushing over Denny O'Neil's scripts. He's OK -- certainly he's made his mark with plenty of other fans. But I find his writing either heavy-handed or like this -- just a bit on the sloppy side. But tossing the benefit of the doubt his way, perhaps a couple of the things working against him were a) the tight editorial control DC was known for and b) the fact that the story was only 16 pages in length. I am willing to cut him some slack in this inaugural authoring of the Man of Steel. 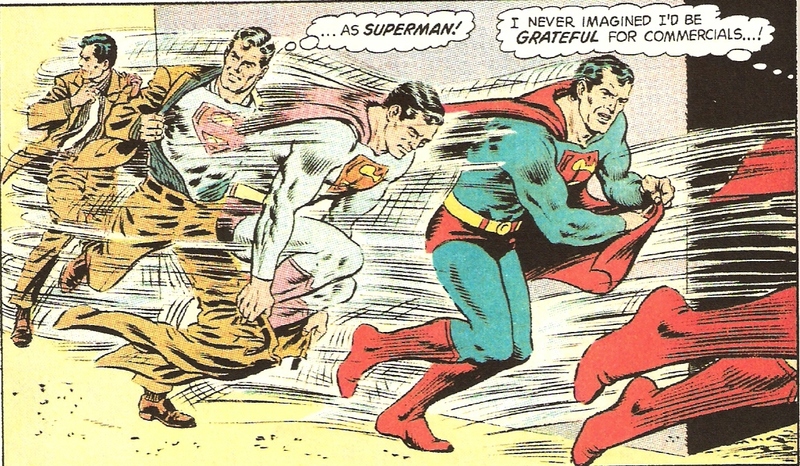 As to the art, count me among those who generally like the Curt Swan-Murphy Anderson team. When we did our recent Bronze Age penciler polls, Swan had his detractors. I've always found him "comfortable" -- not flashy as some other artists of the era, but very steady. And as some of us commented about certain characters who have a "look" in our mind's eye, Curt Swan is the artist on the Superman that shows up in my head. As I said, it's a sense of the familiar. One last comment, before it's your turn: you might notice the coloring of the art samples, which are from the above-mentioned collection. I really like the true four-color, somewhat muted, presentation here. As we all know, reprint coloring can be all over the map -- this standard reproduction is actually quite nice in its aged look. Doug: Yesterday David_B coyly called us out for leaving stuff in the Suggestion Box. He's right, y'know -- we have had a few proddings over the past couple of months, and they've just been left sitting there. Well -- here are a couple of thoughts for today, so have at it -- and thanks to David and to Mike W. for the subjects of today's conversations. Karen: We're starting a new series of posts, gang. Each week Doug and I will bring up a fondly remembered Saturday morning show and throw it out there for discussion, hoping to evoke some memories and stories from the rest of you. I'm starting us off with one of my earliest favorites, the madness known as the Banana Splits! It was like a live-action Jonny Quest in some ways -and had enough action and comedy to keep my interest! Anybody else remember singing along to "Tra la la, tra la la la..."
And if you have any suggestions for future posts, let us know. Doug: My oldest son is getting into buying films on video. He's amassed quite a collection already, from action pics to Disney animated features to the ESPN "30 for 30" series to some of the "classics". He's become a real sucker for the large $5 bins found at stores like Wal-Mart. When we were moving the boys into college a week ago we did run to the local Wal-Mart for some things they needed for their rooms. Sure enough, we made it to the electronics section and checked out their budget offerings. 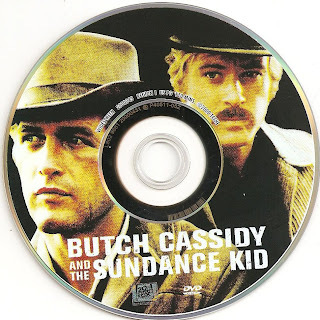 I made strong recommendations for Butch Cassidy and the Sundance Kid and Bonnie and Clyde. 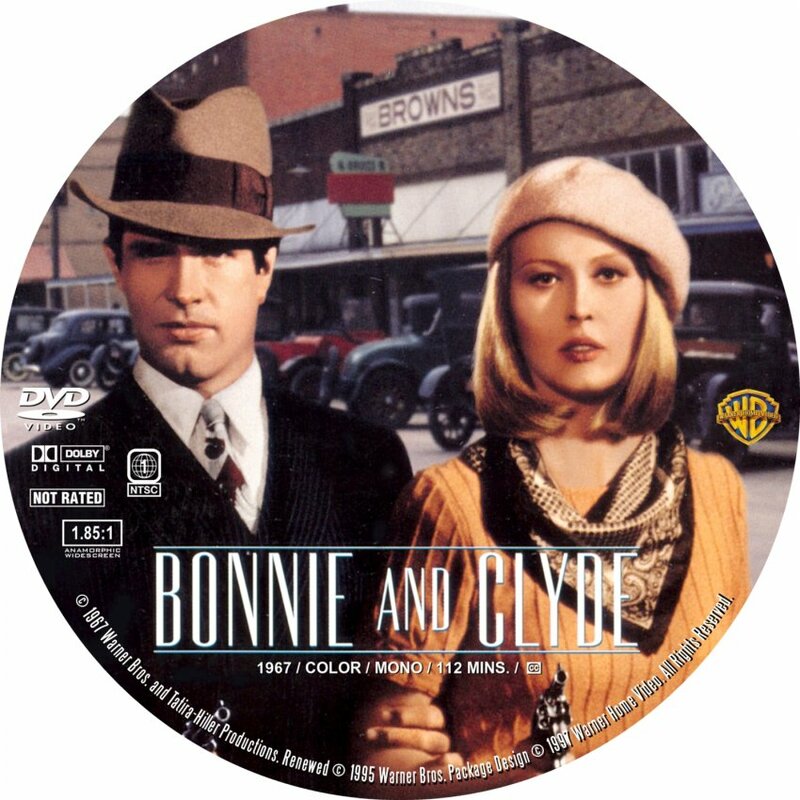 Previously, I'd purchased him Stripes and Caddyshack -- hey, these are the "classics" I was referring to above! Doug: So what are some flicks that you might expect to see on a discount rack that you would highly recommend to a friend? This can be anything from 1960's staples like The Graduate to '80's films such as Pretty in Pink or The Breakfast Club. I'm thinking today of films that when I catch 'em on the TV while flipping channels, I'll stop for a few moments -- or even the entire show -- because I just love them! 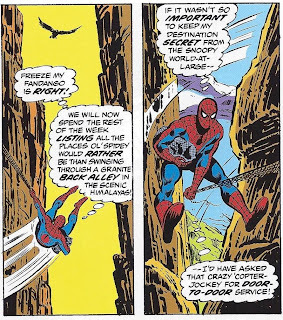 "...And the Nightcrawler Came Prowling, Prowling"
Doug: Hey, after that Marvel Team-Up 3-parter we just concluded, let's fast forward about three years and look in on some team-ups in Spidey's own mag. 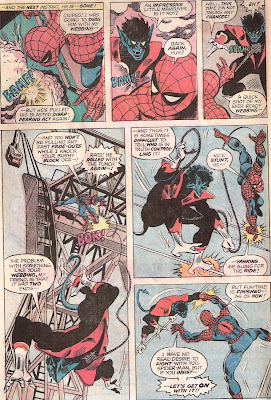 We're going to conclude the month (and actually stretch just a couple of days into September) with a throwdown involving Spidey, Nightcrawler, the Punisher, and the introduction of Jigsaw! So on with it, then! Doug: Man, I was excited to purchase this one off the spinner racks just after I'd turned 10. I was already hooked on the All-New, All-Different X-Men, and that this story opens in the Danger Room of all places was about all I could handle. Nightcrawler's perusing a copy of the Daily Bugle during what appears to be a lull in the normally-death stakes workouts that Cyke usually prepared for the new team. Wolverine seems especially mischievous and totally out-of-character as written by Len Wein here -- I really got a bad vibe from the normally abrasive little psychopath. 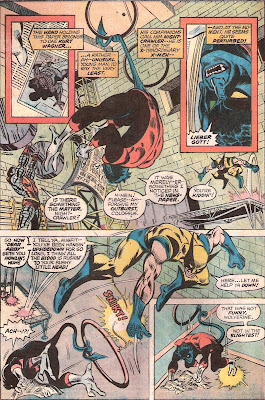 Anyway, Wolverine bounces off a trampoline and cuts the cord on the high ring from which Nightcrawler was hanging. As he falls, Kurt rips the paper in half and comes up fighting mad. 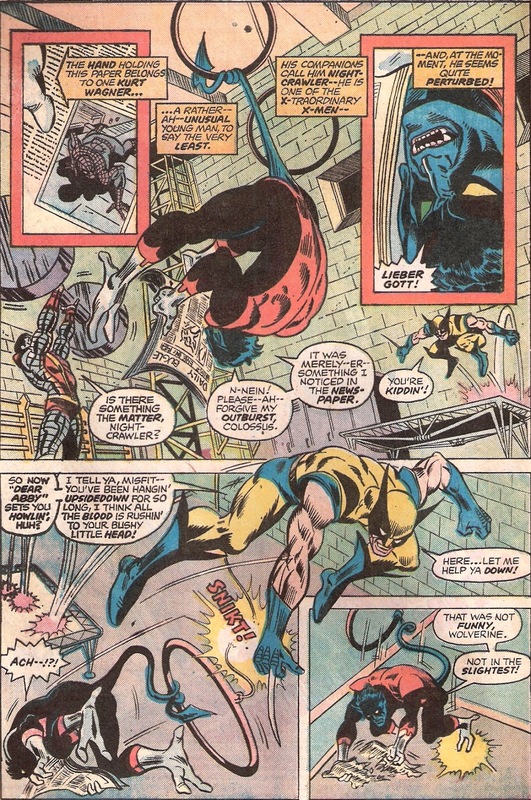 Colossus has to intervene, as you know Wolverine popped his claws at the first sign of trouble. Nothing comes of it, and Kurt takes the high road and stalks off through an open window. Karen: Doug, I was also very excited to see Nightcrawler guest-starring in ASM, as he was my favorite X-Man. I realize that I always gravitated towards the stranger-looking characters in books. Nightcrawler filled that bill in X-Men, but it was also his personality that pulled me in. Of course, when Dave Cockrum was drawing the book, Kurt got more of the spotlight, but that changed when Byrne came on-board. 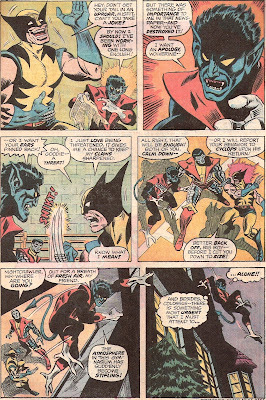 I agree with you regarding Wein's handling of Wolverine -- seems a bit off. For comparison's sake, also cover dated October 1976, was X-Men #101, so we'd seen Wolverine in that title for eight issues at this point (not counting the Giant-Size X-Men nor his Hulk appearances). I think by this time we had a decent idea of his personality, and this kind of practical joke/maniacal laughing stuff just doesn't fly with what we know about the runt so far. 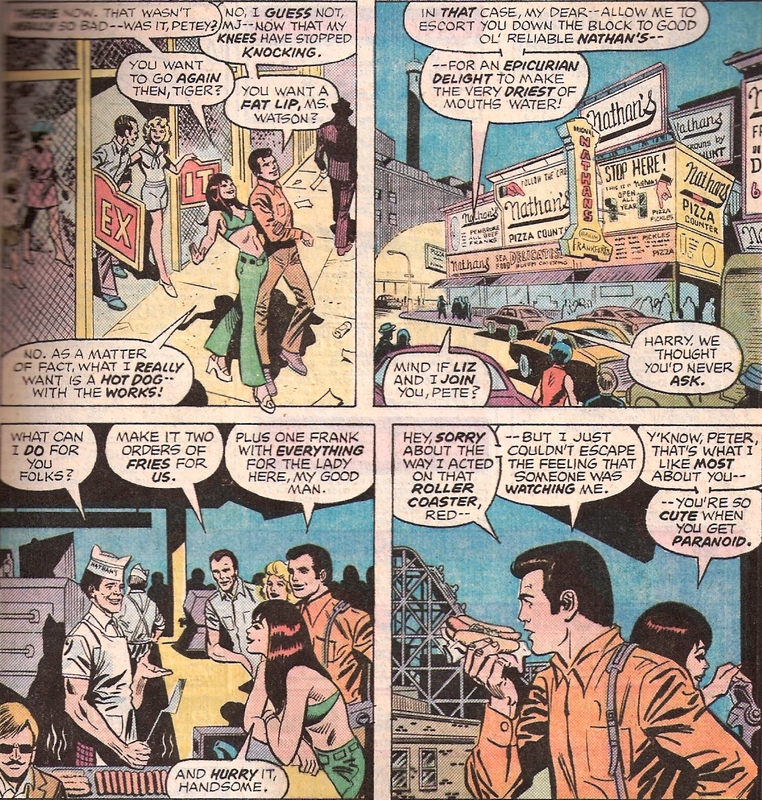 Doug: Cut to Coney Island, where Peter Parker and Mary Jane Watson are on a wild rollercoaster ride. 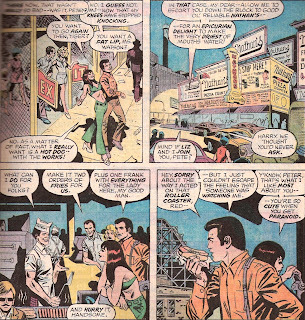 Peter does a good job of feigning fright and sickness, and once he, MJ, Harry Osborn, and Liz Allen are back on solid ground, they head over to Nathan's Hot Dogs for some refreshment. 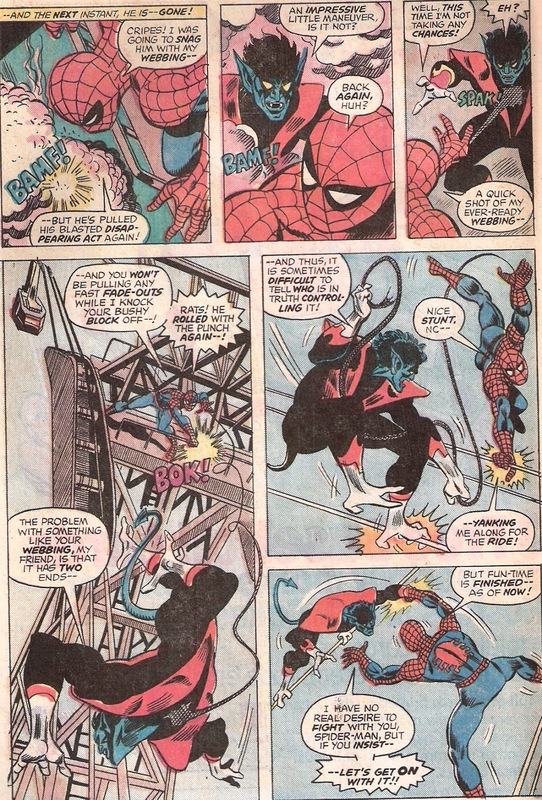 But in a Spidey mag, nothing's ever as easy as it seems, and sure enough -- Peter turns back toward the coaster just in time to see a man shot in the head by a sniper! Doing the usual I've-gotta-get-pictures-for-the-Daily-Bugle routine, Pete dashes away to switch to his web-slinging duds. But also on the scene, and unbeknownst to Peter, is Kurt Wagner. Karen: Even though I am a West Coaster born and raised, I have heard of Nathan's, so that was a cool inclusion. I want to note here also how fierce and demonic-looking Andru makes Nightcrawler look. It seems like he is all fangs. I always think of Kurt as such a nice guy! Doug: Very true in regard to his personality. But what do you think is the most visually appealing aspect of his design? In the Nightcrawler story we ran a little over a week ago, his thick mop of hair seemed to dominate my view of him, but in this story I'd say it's his hands (particularly in a scene toward the end of the story, which we'll show you). Karen: His whole costume is unconventional, and I like how his inhuman appearance contrasts with his very human personality. I think Dave Cockrum (in his first go-round on X-Men) drew him best. Doug: As the shot is fired, Nightcrawler's lurking in the shadows beneath the rollercoaster. Musing to himself that on that paper he'd accidentally torn up back in Westchester was a photo of an old friend, a carnival worker named Eric Hoffman, Kurt is now seeking to find the killer. As he's moving through the shadows, he looks up to see the sniper, still holding a smoking rifle. 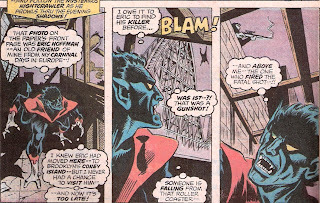 Bounding up and over the wall, Nightcrawler sees the shooter vanish into the roof's door. However, instead of just teleporting through it and pursuing his target, for some reason he remains outside, tugging on the locked barrier. I definitely did not understand that part. Nightcrawler then leaps back to his starting point, where the rifle had been dropped and landed. He wraps it up in a white cloth (found just laying around?) and thinks that he will turn it in to the police, who will need it as evidence. At that point, he's knocked for a loop by a double-legged kick from some familiar boots. Karen: I think there were plenty of opportunities for Nightcrawler to teleport in this story, but Wein was holding off until later in the fight, to give it more impact. Doug: Spider-Man introduces himself in a most aggressive way -- it's funny to read this now and think that Kurt's surprise at actually meeting Spidey was genuine. Nightcrawler had probably been in the States for less than a year at this point. As you might imagine, a genuine tussle occurs, with neither combatant giving any quarter. Nightcrawler eventually stuns Spidey long enough to get away, rifle in hand, but Spider-Man gives chase. 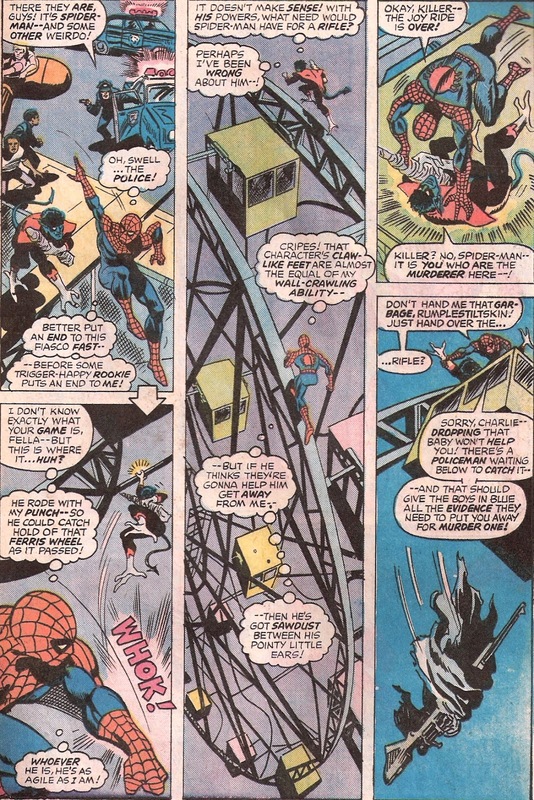 The battle moves to a ferris wheel, which is a cool visual as both heroes run up the spinning ride. 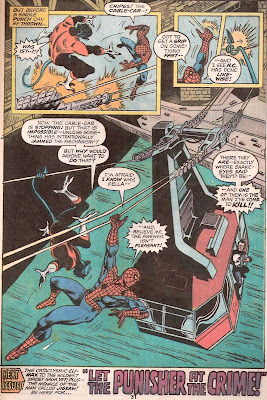 Spidey leaps at Nightcrawler, pinning him to the top of a car; the rifle falls to the ground. Sensing this is turning futile, now Nightcrawler teleports away. Karen: When Spidey punches Kurt it really looks powerful. I was always under the impression that Kurt's strength was just a wee bit greater than normal, so this would be a big mismatch, at least in strength. But in pure acrobatic ability - well, I'd think they're pretty evenly matched. I agree, the scene of the two running on the ferris wheel, with the view from above, is spectacular. Doug: Spider-Man goes to find his trusty camera so that the evening won't be a total loss (what happened to MJ, Harry, and Liz?). Nightcrawler, again lurking in the shadows, sees Spidey swing away and also notices the camera. Since it's far too early for the All-New X-Men to go public, something has to be done about that film. So where was Spidey swinging to? To see his buddy Joe "Robbie" Robertson, city editor at the Daily Bugle. It's now late when Spider-Man arrives, and he surprises Robbie. Spider-Man wants information on the snipings that have been going down, and Robbie tells him that the Punisher is suspected. "Great", Spidey thinks... Just what he needs. 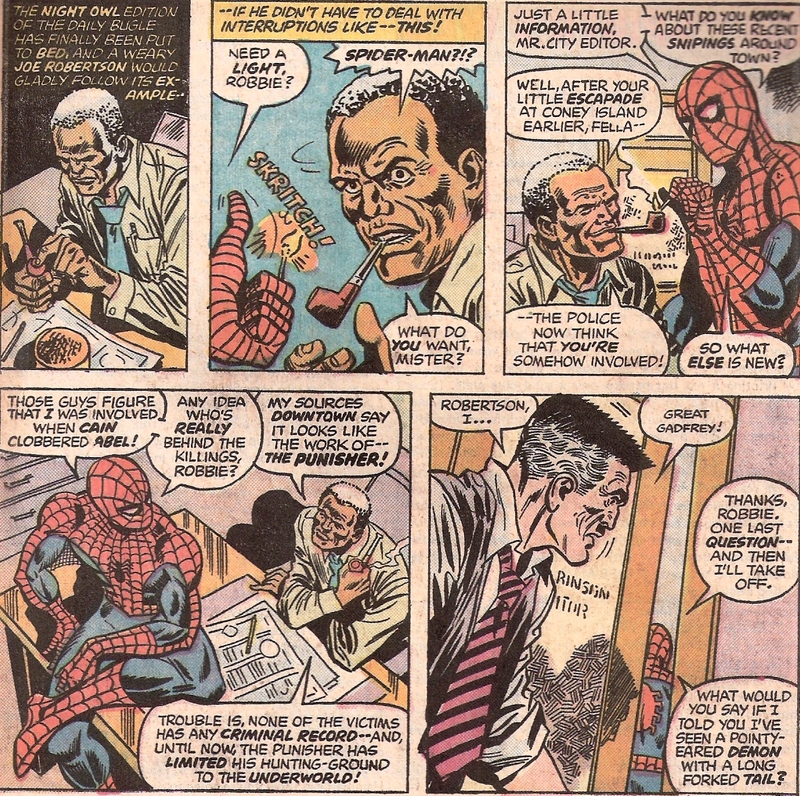 During the conversation, J. Jonah Jameson starts to enter Robertson's office, but then backs out when he hears Spider-Man's voice (why didn't Spidey's spider-sense go off?). 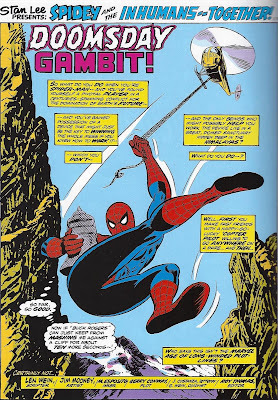 As Spidey finishes, he asks Robbie about fighting fuzzy forked-tail demons. Robbie says he should have his head examined. 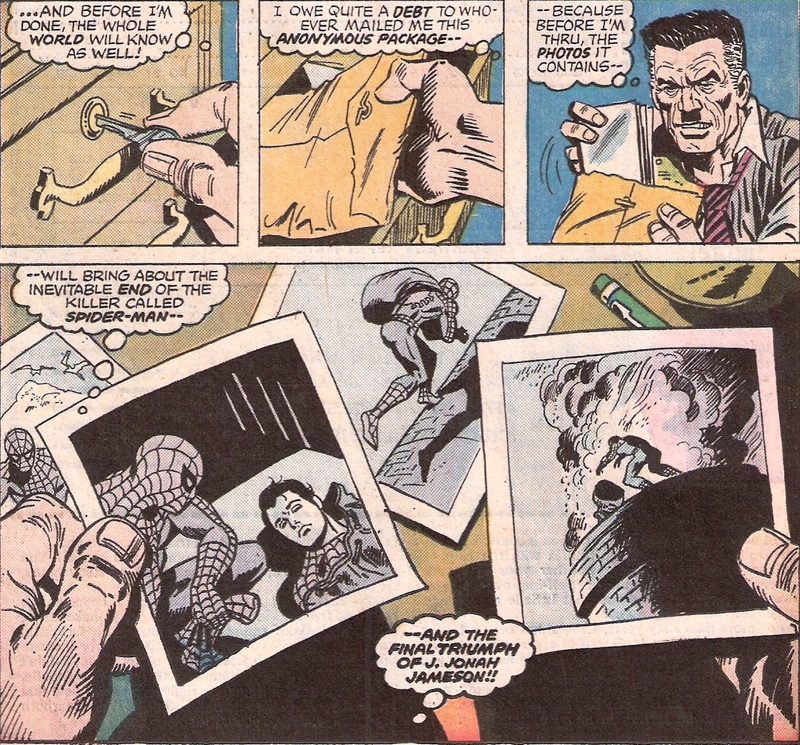 As Spider-Man swings away, JJJ goes back to his own office and removes a crumpled envelope from a locked drawer. 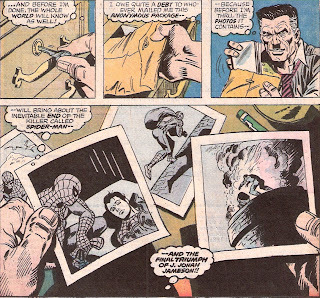 Sliding he contents out and spreading it around his desk, we see that someone has sent Jonah a series of photos... of Spider-Man disposing of the Peter Parker clone! Karen: Oh that damned clone! Well at least we don't have to deal with that in this review. I always liked Robbie and Pete/Spidey's relationship with him. Robbie was that nice voice of reason in contrast to JJJ's hysterics. This was back when I actually thought the Punisher was an interesting character. He was still very much grounded in the adventure novels and crime films of the day, and despite being willing to kill bad guys, he still had a code. He wasn't a psycho, which I feel he eventually became in the 90s and on. Doug: We then get an interlude featuring the Punisher. Ol' Frank Castle comes to a haven of underworld types, offs three of them, and gets the information he wants from one Joey Whisper -- who has been going around town pulling jobs in imitation of the Punisher? Karen: Hey, he said he just wanted to talk! They didn't have to pull their guns on him. Doug: Spider-Man's out on patrol when he stops for a break, atop the 59th Street bridge and the new Roosevelt Island Tramway. He's thinking that in his limited encounters with the Punisher, there's not been a single innocent harmed. What's been going down just doesn't have his stamp on it. 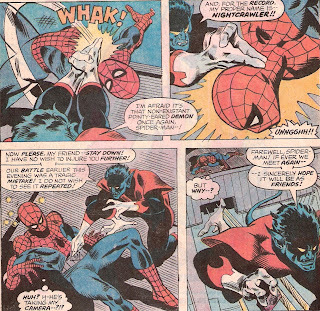 Suddenly Nightcrawler appears and whacks Spidey upside the head, twice and hard! 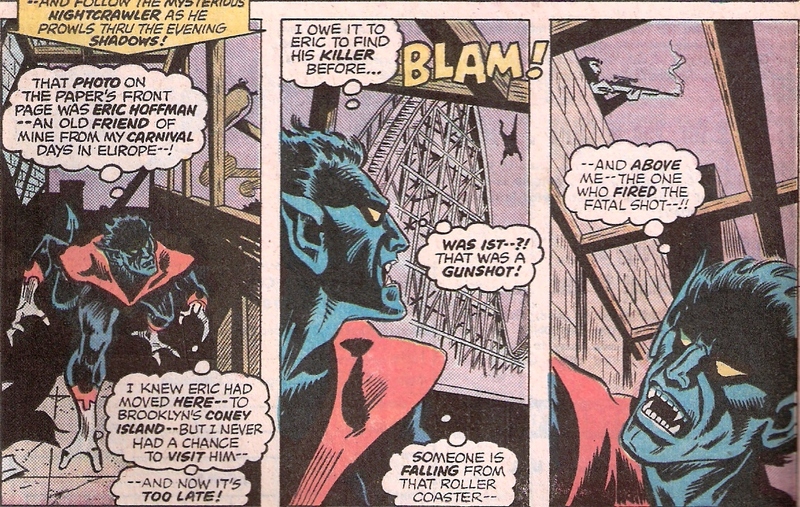 Now tell me something -- unless Nightcrawler had trailed Spider-Man to the Bugle and away, how the heck did he find him? Anyway, Nightcrawler grabs the camera from Spidey's belt and makes tracks. Spider-Man gives immediate pursuit to Nightcrawler, who has now begun to traverse the cables of the tramway. As the Wallcrawler catches up, Nightcrawler rips the film from the camera and tosses the device back to Spider-Man. Well, that doesn't exactly please ol' Webhead, who right-crosses Kurt Wagner right off his perch. 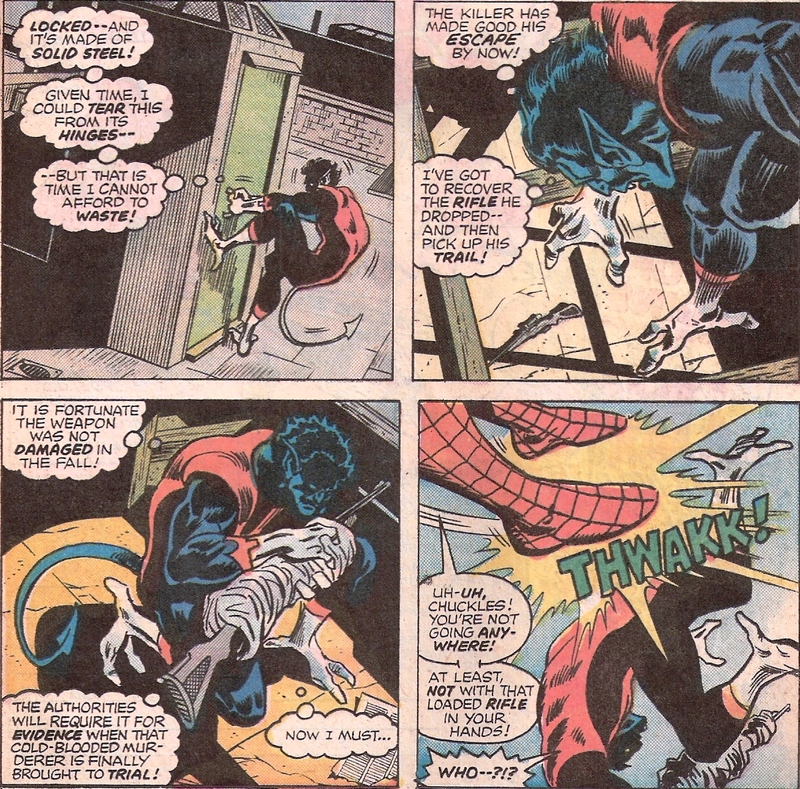 However, in mid-descent Nightcrawler teleports and lands right behind Spidey. Not to be taken by surprise again, Spider-Man shoots a web at Nightcrawler's chest and pulls him forward, only to sock him one -- knocking the mutant off the ironwork. Both combatants end up lighting on the tram cables when a cable car comes along and stops right where they do battle. And who should lean out of the car? The Punisher, that's who. He says he knows who's been impersonating him, and he's come to exact his own form of justice -- by killing that man! Karen: I've said before that Andru doesn't do a whole lot for me. I don't dislike his work but I don't love it -- it's just OK to me. But I do really love that shot of Spidey swinging high above the tram tower. To me it captures the freedom and thrill of his web-slinging. It looks fantastic. 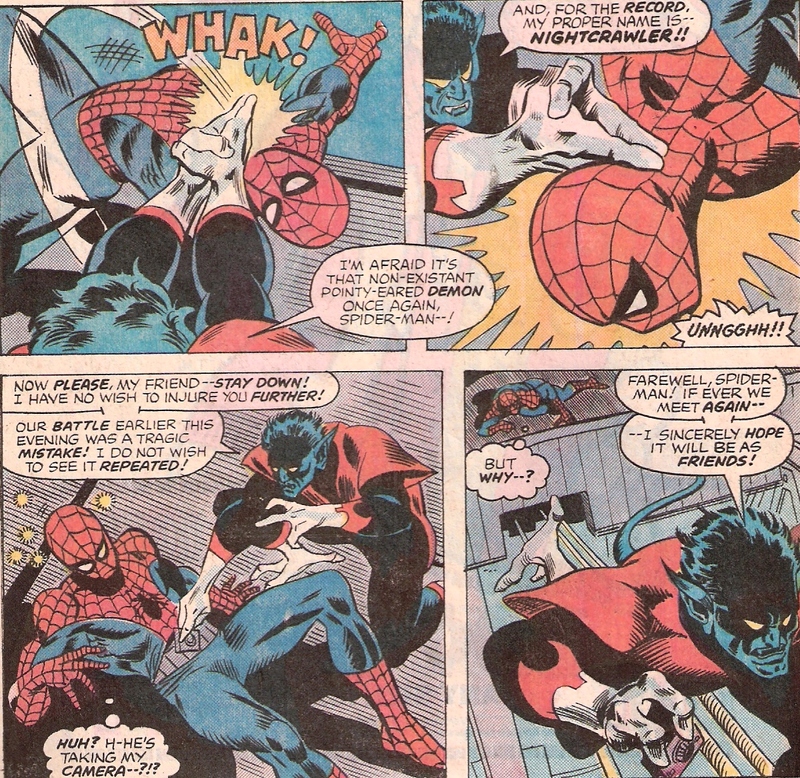 Nightcrawler's assault on Spidey was fun -what was he doing, putting some sort of nerve blocks on the webhead? Those were strange moves. I love how he's apologetic about the whole thing -that's in character for Kurt. Their ballet on the cables was cool. Of course, having the Punisher make his declaration at the end of the book was the perfect cliff-hanger. 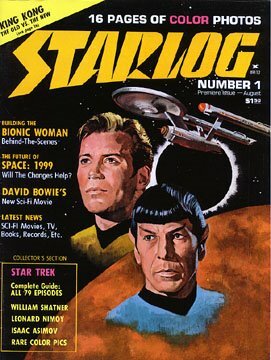 Doug: I enjoyed this issue. It's all basically set-up for next week's conclusion, but it was a fun, easy read. You know, we've remarked over the past several weeks about fun issues being so easy to write about and clunkers can be difficult motivation-wise. But other than some of my nitpicks with Wein's script (again, I'd have never caught those discrepancies when I was 10), the art job was pretty solid. Mike Esposito and Dave Hunt did a nice job of softening some of the harsh facial expressions that Ross Andru could draw during this era. I have no complaints on the storytelling, either -- this one was very clear as to what was going on, pacing, etc. For my money, this was a decently-spent 20 minutes of my time. Karen: I couldn't agree with you more about this issue. It moved along nicely, the plot was clear, characters were well handled (with that possible exception of Wolverine) and the art was pretty solid. After three weeks of some pretty awful reviews, it was great to have a solid issue to work with! Karen: We could debate the result all day (and I thought Thor was out of character) but it's amazingly well done for a non-professional effort. Karen: How about the latest trailer for the real Thor film, Thor: The Dark World? What do you think? Doug: And just yesterday, I saw a series of stills from the new Thor film. You can check them out over at MarvelousNews.com. 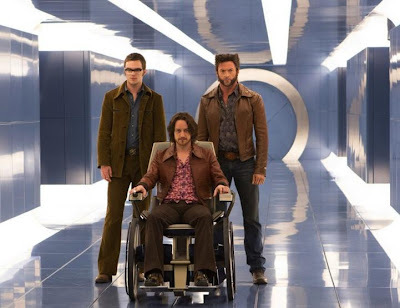 Karen: Speaking of Marvel movies, here's a new picture from X-Men: Days of Future Past, with some very 70s versions of Wolverine, Prof. X, and Hank McCoy. Love those lapels! 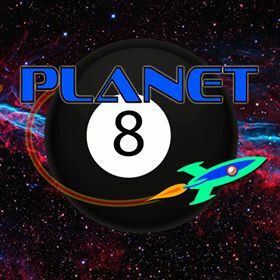 Karen: Late-breaking news; Not a hoax! Not an imaginary story! Ben Affleck to play Batman in the Batman-Superman movie! http://variety.com/2013/film/news/ben-affleck-is-the-new-batman-1200586881/ Holy lame casting! 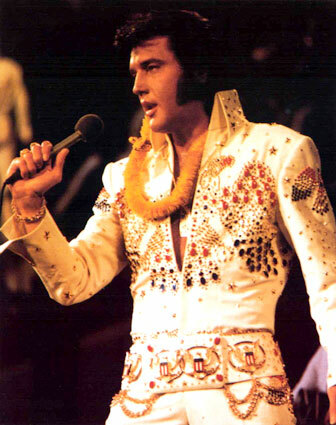 Doug: The 36th anniversary of the passing of Elvis Presley was a week ago. 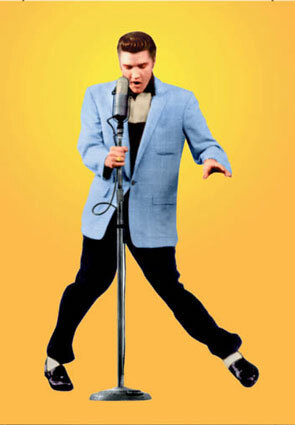 I don't know that we've ever discussed the King of Rock 'n' Roll on this blog. Today's the day. Doug: For those of you who saw today's headline and came here expecting to discourse on all things Jack Kirby... well, I tricked you! Also, hold onto your Ben Affleck comments until tomorrow when Karen opens up the BAB potpourri pot! It's the weekend, kids -- enjoy! Doug: Well, I've had to go back to work these past three days. I mean, it's not like I didn't work all summer -- my wife and I were conversing last week and I think I determined that between my high school and the U.S. Holocaust Museum there were only 10 days over the summer that I didn't do significant work for someone. Now that's a nice vacation for most folks, but let's face it -- having an 11-week break is a source of envy for many people! Doug: But enough about that. Today I want you to reflect on your school days, from when you were just a tot all the way up through whenever you want to stop. Fashions, homework, fave or not-so-fave teachers, cliques, sports, fine arts, whatever -- it's your day to reflect on all things education-related from your personal backstory. And, if anyone wants to say a word toward their fave school-related film or TV show that would certainly be fine as well! NOTE: You know Karen and I always include a little art, or a video clip in our posts. I wanted to post a scene from Fast Times at Ridgemont High, but it said on YouTube that there was no embed code due to request. 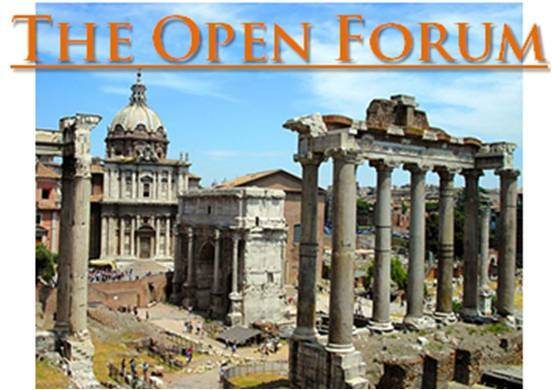 Well, not to be completely stymied, you can check out what I was going to post by clicking here. Thanks! Karen: So who's ready for part three? We've been rather hard on this storyline, but now we're in the home stretch, and I can say while this isn't a classic, it isn't nearly so bad as our last outing. Besides, at least it's jam-packed with Inhumans to ogle! 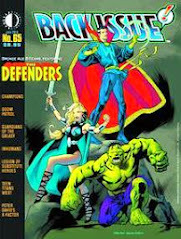 And that cover is pretty sweet -it looks like Romita to me, and Comic Book Database lists Romita, although it says, "Unconfirmed," so I suppose it's their best guess. Doug: Image-wise, I couldn't agree with you more -- it's indeed a most sweet drawing. But "the most long-awaited battle in the history of comicdom"? Ummm... Stan would be proud of that sort of hyperbole! Karen: Len Wein takes over the scripting chores, and his Spidey is much more light-hearted than Conway's, who is still given credit for the plot. I was thinking about it, and this whole story seems like it could have been inspired by Bob Haney and his bizarre Brave and the Bold tales which my partner has featured here frequently. It's a team-up, it's convoluted, it's apparently out of synch with continuity...and much of it leaves you shaking your head. 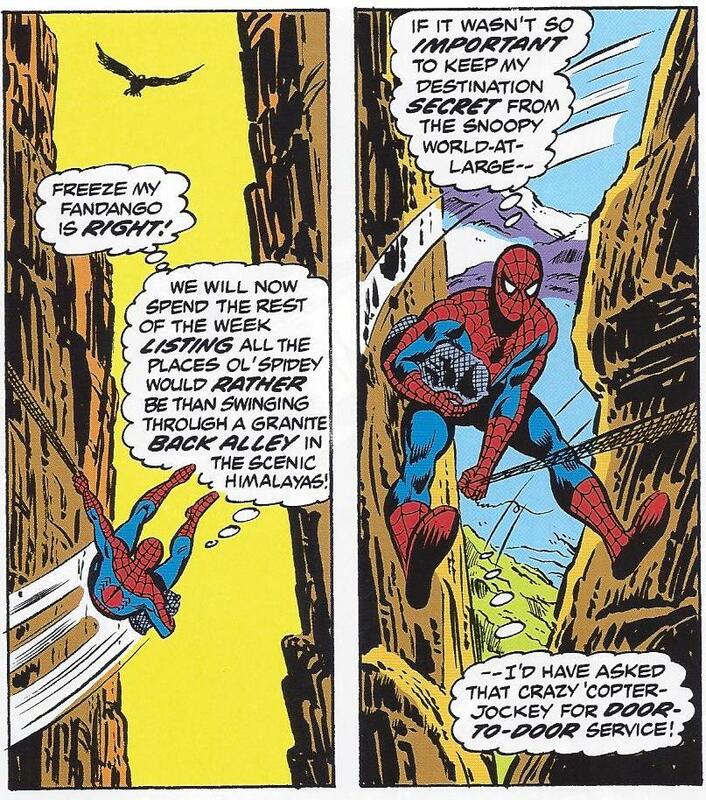 Our first head-shaking moment is the splash page, where we find Spidey swinging down from a helicopter deep into the Himalayas -yes, he's hitched a ride all the way to the Himalayas, and manages to ignore the freezing cold and swing between the mountain peaks as he searches for the hidden home of the Inhumans. Let it go. Just let it go. Doug: Specifically, the travel in this storyline has been about as implausible as that Brave and the Bold we reviewed where the Flash ran to the sun! As to the specific travel on the splash page (so are we to believe he found an American 'copter pilot in a) Latin America, b) SE Asia, or c) none of the above -- somehow he hooked up with this guy and they found a bird with big enough gas tanks to fly around the world), I suppose it doesn't stray too much from how we've seen the Webslinger gettin' around NYC -- on the roof of a bus, swinging from a news station's traffic helicopter, or bouncing from building to car to truck. BUT -- yeah, you already said it. I do like the pose that the art team employed, however. Karen: We should take a moment to discuss the art. Jim Mooney is back again, this time inked by Mike Eposito. It's serviceable, but I find Esposito's inks less pleasing than Giacoia's from last ish. I'm not sure what it is about it, but the art just looks a little rougher. Doug: I think the influence of Esposito is most seen in the faces throughout the story. Last week I commented that I can generally spot Jim Mooney's work, mostly through his faces (specifically the eyes). But here it's not so obvious. I'll add that there's a hint of Gil Kane (read: Kane's influence. I'm not suggesting that Kane had any role in this mag) in some of the figurework. I also noticed that at times bodies seem a bit stiff, like poorly-articulated action figures might have been used as models. 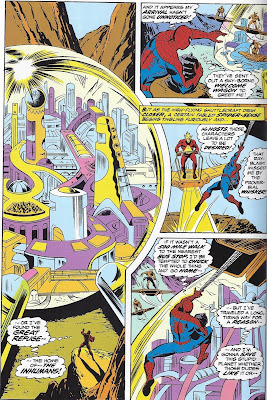 Karen: Back to the story, Spidey comes through a pass and sees the huge dome of the Great Refuge, home of the Inhumans. 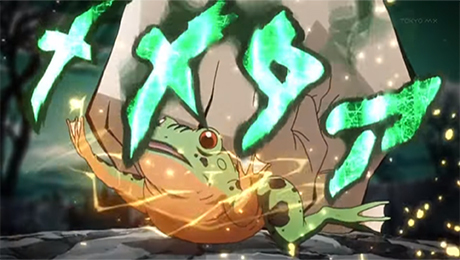 He's immediately attacked by some of the residents, who come after him on funky flying platforms. One of them clips him, and he falls, only to be caught by another. But the web-slinger is out for the count. 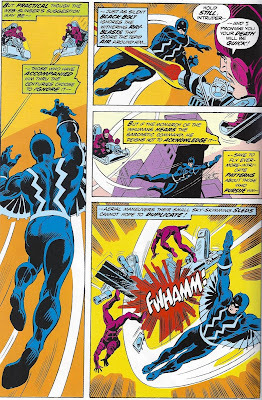 He regains consciousness in the throne room of Black Bolt, ruler of the Inhumans. With the king are his royal family -- Gorgon, Triton, and Karnak, who acts as Black Bolt's voice. Karnak questions Spider-Man, asking why he has come to their hidden land. Spidey then spends nearly two pages recapping MTU's 9 and 10, thankfully leaving out some of the more insipid parts. 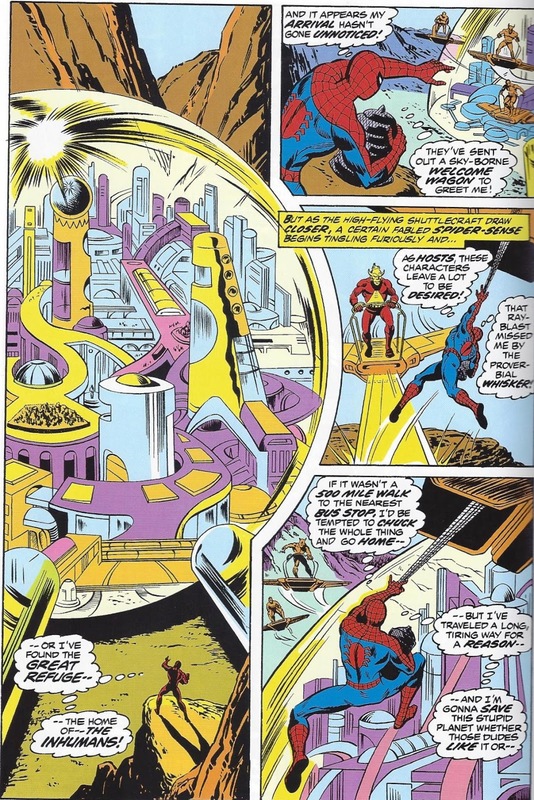 He explains that he has sought out the Inhumans because Zarrko's time disruption device emits a radiation similar to that of the negative zone around the Great Refuge, and Spidey thought maybe they could figure out some way to use the devic to send him back to Zarrko's time to save the Avengers and battle Zarrko and Kang. Gorgon, always ready for a fight, pipes up that they'll all go to the future with him -- and then remembers to ask Black Bolt what he thinks. The silent king is all for it. Doug: Did you think it was a little clunky that Spidey carried the device, rather than making some sort of backpack out of webbing to schlep it around in? I'm thinking that if I were him, I would rather have been a little more precise in my webslinging around those mountains. You know, had we the time, a neat post would be to assemble images of single-carry assault vehicles! But I don't have the time. Hey, Comicsfan!! Is that in your wheelhouse? Doug: Spider-Man was unconscious for some time -- I loved the minutiae of actually showing his webbing dissolve off of the time bomb. 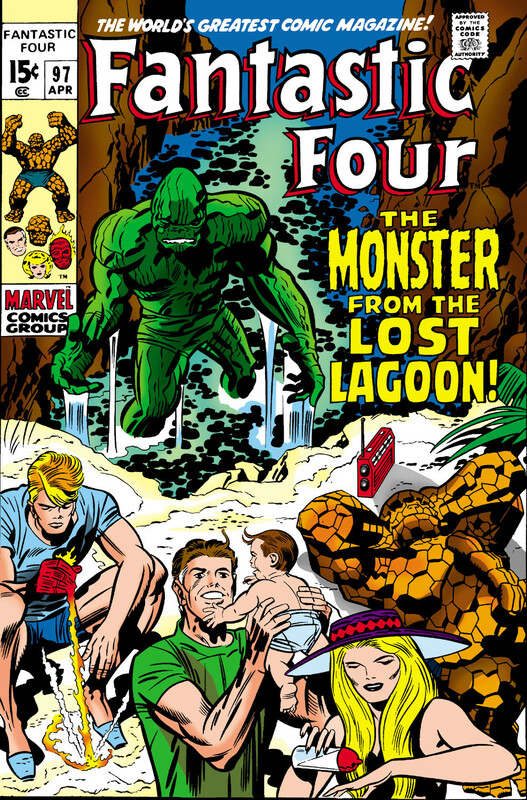 Karnak was his usual short-man-syndrome self; come to think of it, Triton's easygoing personality sort of saves the Royal Family's men from being a complete set of asocials! I'm with you on the recap -- had we done this as a single issue review rather than a 3-issue arc, I think we'd have both been happier! I'll also agree with you, now that we're about halfway through this issue, that Len Wein's dialogue (while not perfect) is more palatable than what Gerry Conway had written in parts 1 and 2. Karen: The royal family takes the time device to Maximus, their insane cousin who is locked up in a nice, safe cell, and asks him if he can turn it into a time machine. Of course he says yes, and they hand it over to him. Spidey is incredulous -"You guys sure you know what you're doing?" he asks when he sees Maximus, who looks like he could give the Joker a run for his money in the fruit loops department. 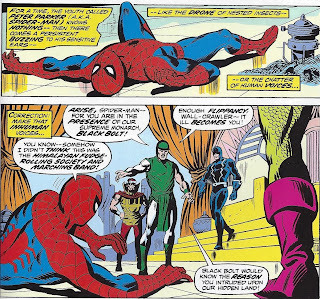 Karnak tells Spidey to relax; sure, Maxie is nuts, but his pride won't let him fail. Oh-kay...you mean he wouldn't use the parts to create a death ray or anything like that... or to escape...? OK, let's just roll with it. While Maximus works on the time machine, Triton gives Spidey a tour of the Inhumans' home, but the wall-crawler is impatient -he's itching to get 'back to the future' and set things straight. They return to check on Maximus and find he's finished adjusting the device. He tells the five of them to gather around the device and as they do he presses a switch and whammo! They find themselves standing outside the future citadel that we saw in issue 9. 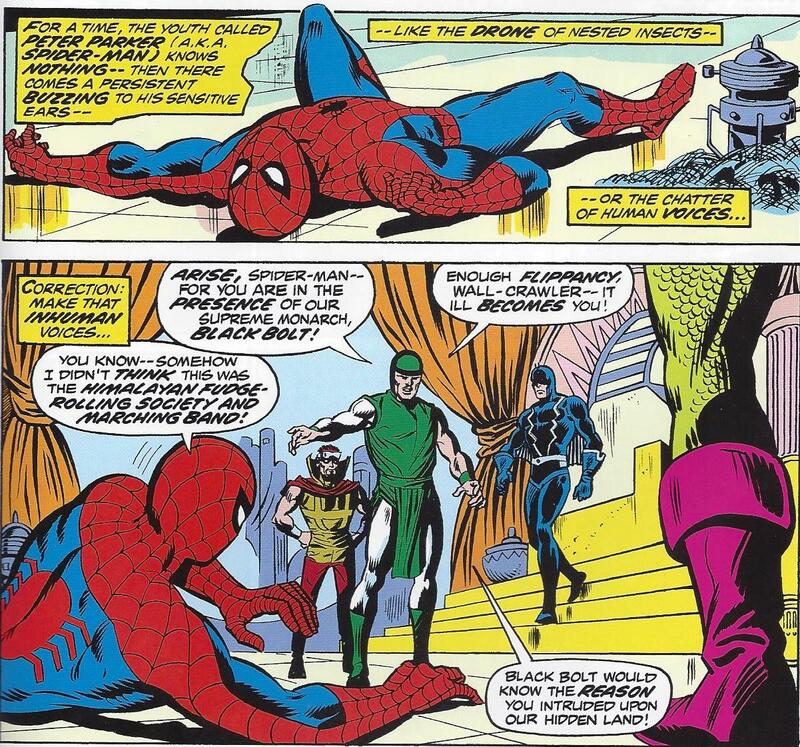 But oddly enough, they have come back at a point in time prior to when Spider-Man left, as he sees the guards all still lying around and Zarrko entering the building and repeating his actions from before. Just as they are about to enter the citadel, they are attacked by guards on flying sleds. 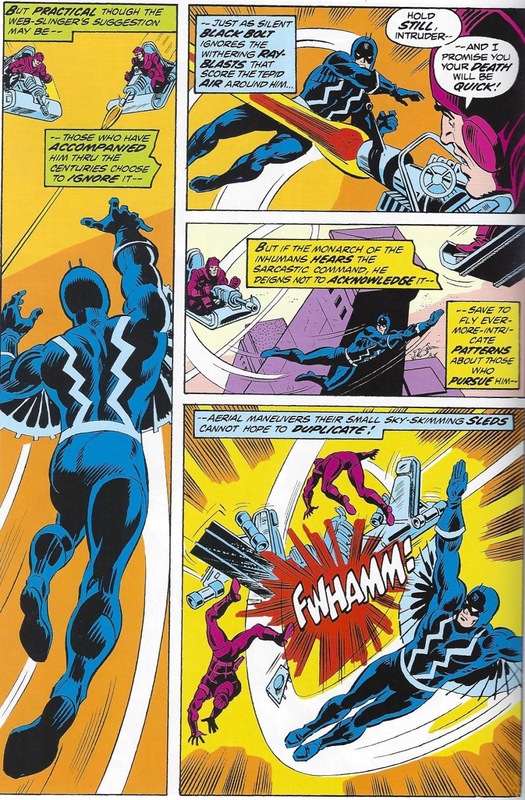 Black Bolt takes to the air, and weaves about, causing two of his attackers to slam into each other. On the ground, Gorgon stomps one of his huge hooves and sends men flying. 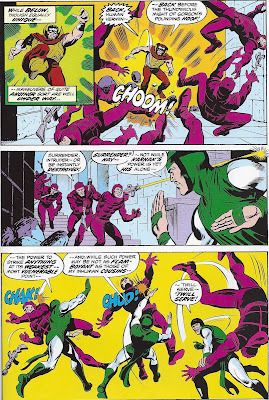 Karnak on the other hand essentially karate chops his foes. 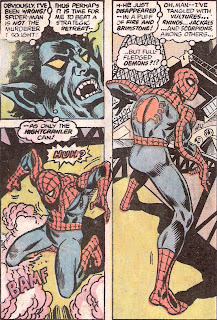 Spidey once again spins a huge web to trap the flying soldiers, like he did in issue 9, and Triton just punches guys. So we have a demonstration of each hero's powers, but to be honest, it's kind of lackluster. Doug: You know, Black Bolt and Maximus are brothers, Medusa and Crystal are sisters -- why are all of the other Inhumans only children? That brings me to a thought, so here's a little "Inside the BAB editorial meeting room" -- for a couple of years we've knocked around the idea of doing a series called "Tales of Attilan", where we review some of the Lee/Kirby Inhumans tales that ran as back-ups in Silver Age Thors. What sayest thou, the faithful BAB reader? But back to the story at hand... you know how, a few years ago, the Hulk was blasted off to the moon or wherever? Maximus was such a pain in the fanny over the years, I don't know why the Inhumans didn't do that to him! Your misgivings about Maximus are well-placed -- who is to say that the little nutjob didn't memorize how the time bomb worked and come up with something similar of his own design later? And how did they trust him in the first place? Death ray, indeed! Doug: I know many of our readers enjoy the nit-picking that can go on in time travel, so here's one for you: Maximus sent the good guys back to the future, but arriving minutes before Spider-Man vacated the premises to try to get help. So technically, Spider-Man has been alive in the time in which the Inhumans arrive as the cavalry. Doesn't his presence in this scene duplicate his presence in the scene as it played out back in issue #9? Effectively, there are two Peter Parkers running around now, one living in the moment and the other with knowledge of events yet to occur. 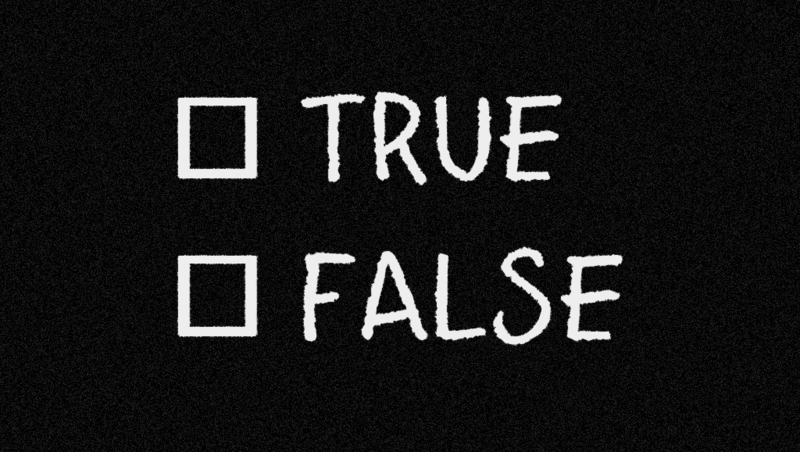 Raise your hand if you find this confusing. of Marvel Team-Up seems to be that midway jumping on point for new readers, historically speaking. 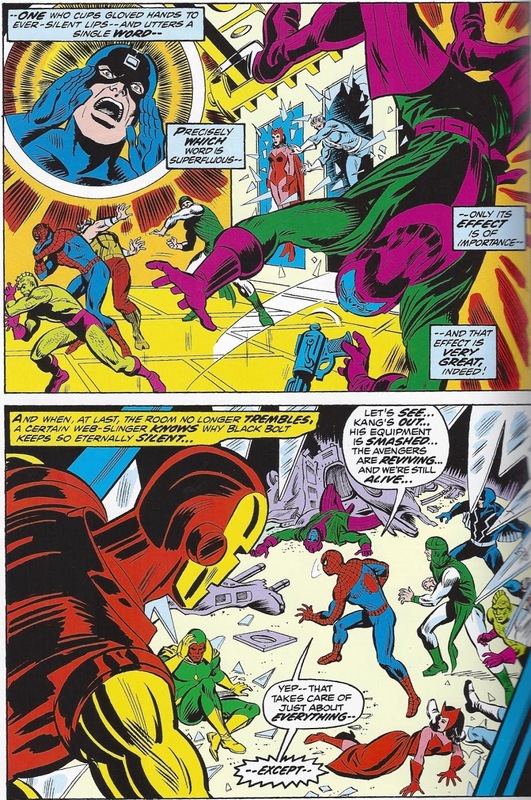 Karen: Finally our quintet breaks through to where Kang and Zarrko are squaring off (with the Avengers locked up like action figures on shelves behind them). 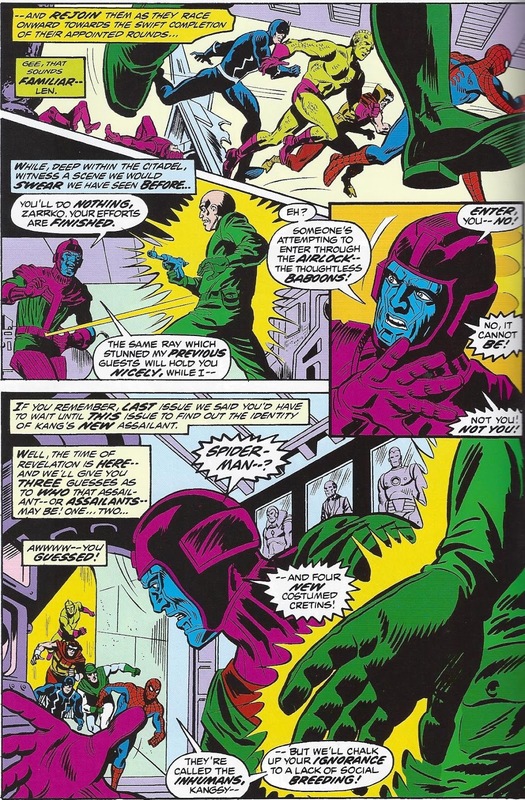 Kang zaps Zarrko with the same ray he had paralyzed Spidey and Iron Man with, and then turns as he hears the airlock opening. Kang sees the new arrivals and surprised, shouts, "No, it cannot be! Not you! Not you!" 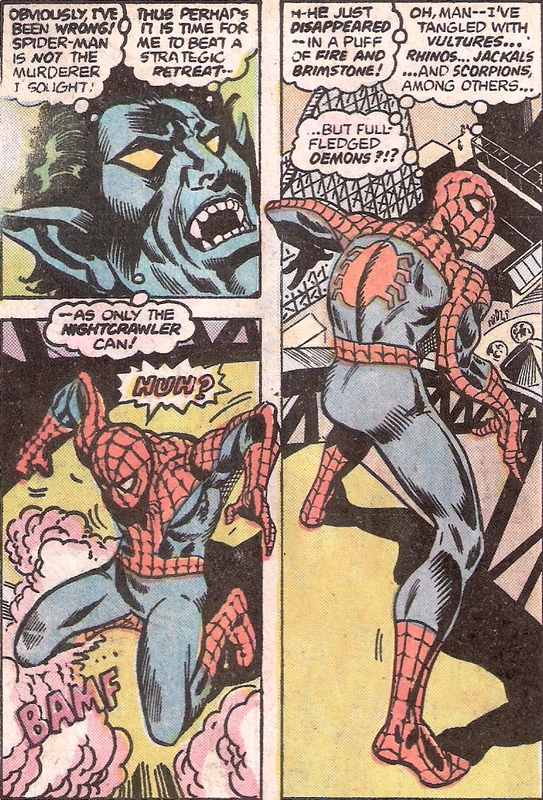 So now we know who he saw in issue 10 after Spidey left- although his reaction seems a bit over the top! He quickly recovers his wits and tries to zap our heroes but they dodge his ray. Seeing this, he conveniently tells them that once he flips this switch, the Avengers will die. But Spider-Man sprays webbing on his hand, making it too sticky to pull the lever (that's what it says! 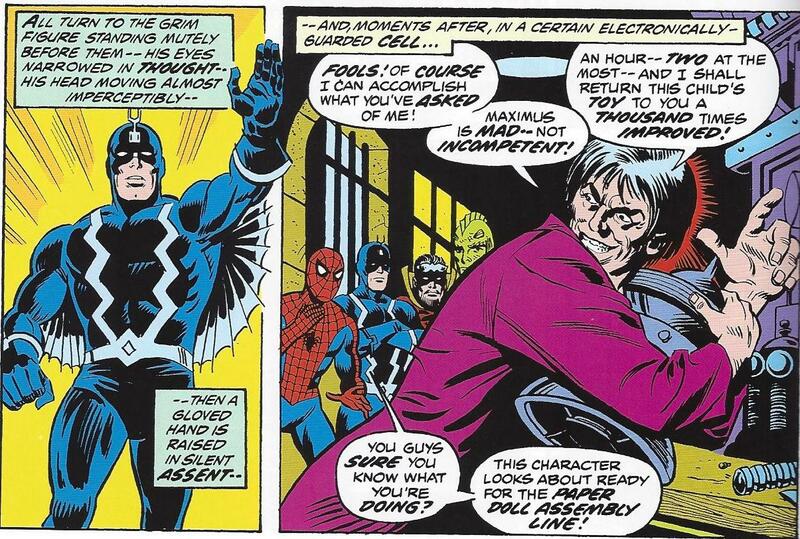 ), so with his other hand, Kang pulls a pistol and is about to shoot, but Black Bolt sees this and decides to speak. Yes, he can level buildings with his voice, but he's apparently being careful. He sends the time-warrior flying, also smashing his equipment, and freeing the Avengers. How's that for efficiency? Spidey sees Zarrko trying to take off, so he hogties him and rolls him up in a web ball. Karen: Everything seems good, the Avengers are getting back on their feet, the villains, have been foiled -- hey,what about Kang? Spidey goes to check on him and discovers-an empty suit! "We were battling -a puppet!" Suddenly a voice comes out of nowhere, and tells the heroes that they think they've won, but they'll meet again, blah blah blah. So it seems Kang was never really there, although this whole empty suit thing is pretty silly. Why not just have a robot? How does an empty suit move? 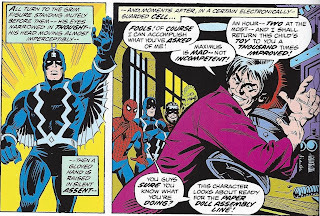 Anyway the time device conveniently teleports Spidey and the Avengers to New York, and the Inhumans to the Great Refuge, and things are pretty much back to status quo. Karen: I suppose this three-parter ended better than we might have hoped, based on the middle section, but this ending was still fairly mediocre. I feel the art was a real let-down. You've got the Inhumans in the book, so you have at least five super-heroes running around for a good portion of the time, yet there was no sense of excitement to this tale. The fight scenes were dull and static. The biggest problem was the story was weak. I think this was not unusual in MTU and other team up books. I've read the first ten issues of MTU in the Masterworks format now and I can honestly say they're mediocre at best. They're mostly an excuse to get two characters together. Now I do think there were some very good MTU's put out -the Claremont/Byrne run was exceptional - but by and large, these early issues were not very good. Doug: Our buddy J.A. 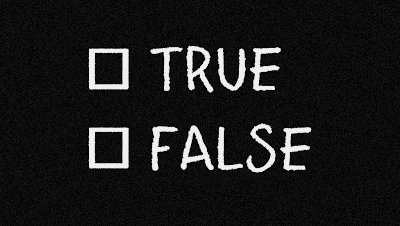 Morris, among many others, has used the term "holds up" when referring to certain stories here and on his own blog. 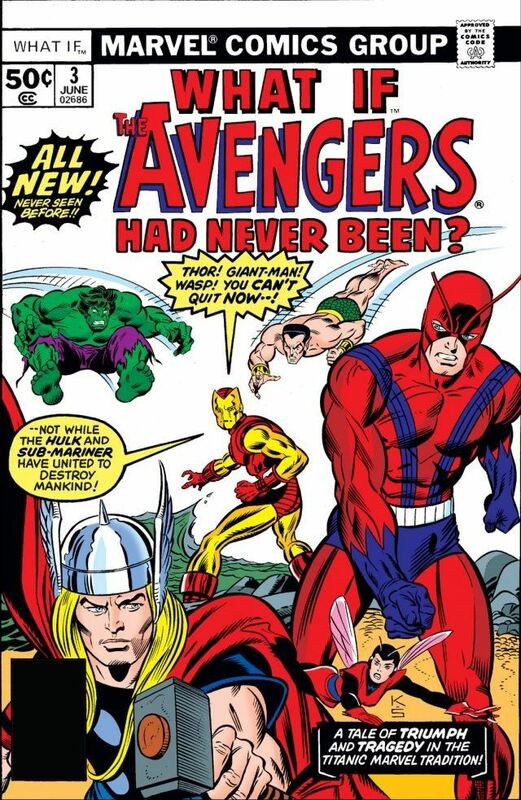 I argued many years ago over on the Avengers Assemble boards that I didn't know what that meant, that even the not-so-great stories had an inherent charm linked to the time in which they were written. Feeling middle-of-the-road and non-combatitive as I write this, I'll offer that this 3-parter is indeed something that doesn't "hold up". Karen and I have remarked that as we write these reviews some 25-45 years later that it is difficult to view them as we did when we were children. But man -- how cool was it to grab these off the shelf or spinner rack back in 1973? Seriously? 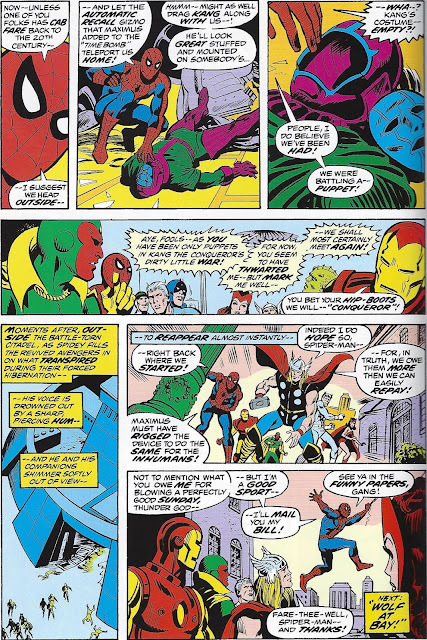 Iron Man, the Torch, the Inhumans, the Avengers, and Kang the Conqueror. Sign me up! But as discriminating adults, this storyline, as a story, borders on rubbish. 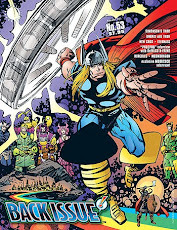 So, hard as we've been, I keep telling myself that when I purchased Marvel Two-In-One #7 with the Thing, the Valkyrie, and the Executioner on the cover it was the best piece of literature I owned at that time. And since I haven't read it since 1974, I don't even know if it holds up -- but I still have that goofy-grin feeling as I did when I was an 8-year old. And somewhere there's a Bronze Age fan who didn't read today's review, who still thinks Marvel Team-Up #'s 9-11 is some fine reading. I think I envy that person. Who's the Best... Significant Other? 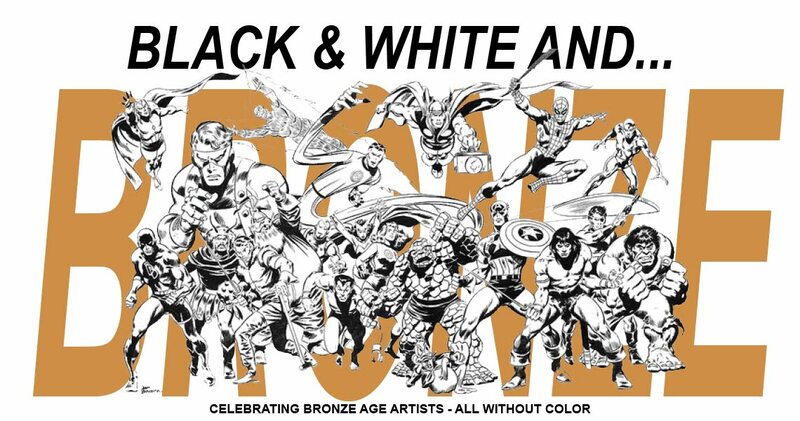 Who's the Best... Inker on John Buscema?